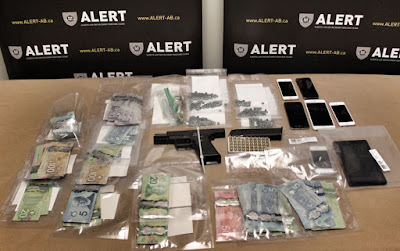 ALERT - A suspected Lethbridge fentanyl dealer is out two vehicles and more than $10,000 cash following an ALERT bust that unfolded in Lethbridge and Coalhurst. ALERT seized 271 fentanyl pills and a loaded handgun. ALERT Lethbridge’s organized crime and gang team concluded the investigation on December 1, 2016 with help from Lethbridge Police Service and RCMP Coaldale. The investigation targeted a suspected fentanyl dealer operating in the two neighbouring communities. ALERT seized 271 fentanyl pills, a loaded handgun, $13,315 cash proceeds of crime, and two vehicles. The vehicles, worth an estimated $30,000, and cash were seized as offence related property and will be referred to civil forfeiture. “Unfortunately, fentanyl dealers are profiting at the expense of people’s lives. We are all aware of the perils and societal cost of this horrible drug and ALERT will continue to target fentanyl dealers and hold them accountable,” said S/Sgt. Rod Klassen. The handgun was found unsecured and equipped with a prohibited 22-round magazine. The handgun appears to have been illegally modified with aftermarket parts and the RCMP’s National Weapons Enforcement Support Team is providing assistance. Possession of proceeds of crime (x 2). Mohamed’s associate, Morgan Mitchell was arrested at the home on Mt. Blakiston Road West. The 21-year-old was charged with possession for the purpose of trafficking and possession of proceeds of crime.